Coding qualitative data can be a daunting task, especially for the first timer. 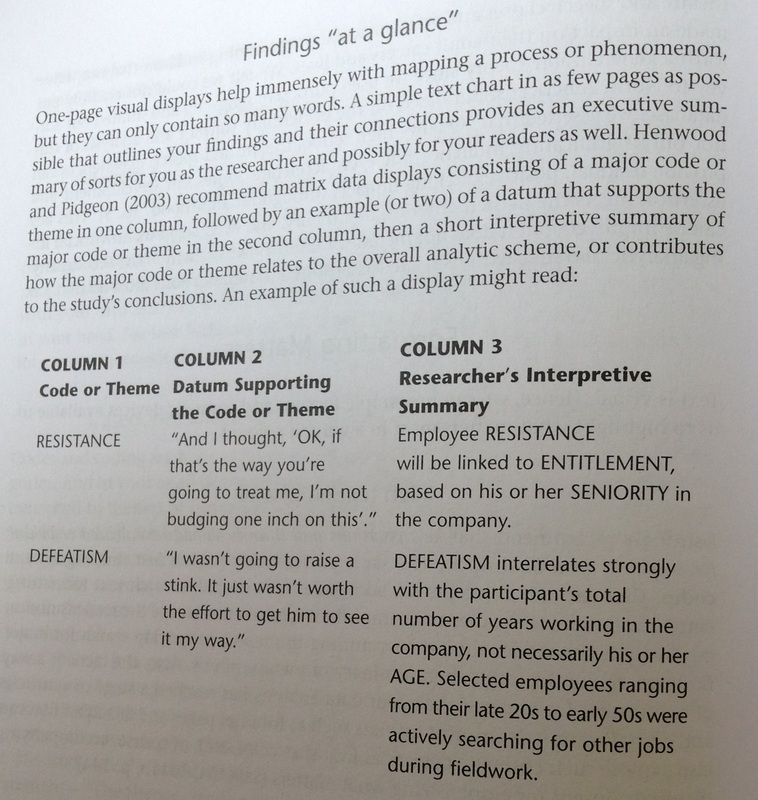 Below are my notes, which is a useful summary on coding qualitative data (please note, most of the text has been taken directly from The Coding Manual for Qualitative Researchers by Johnny Saldana). what are people doing? What are they trying to accomplish? How, exactly, do they do this? What specific means and/or strategies do they use? How do members talk about, characterise, and understand what is going on? what do I see going on here? what did I learn from these notes? why did I include them? Gordon-Finlayson (2010) emphasises that “coding is simply a structure on which reflection (via memo writing) happens. It is memo-writing that is the engine go grounded theory, not coding”. 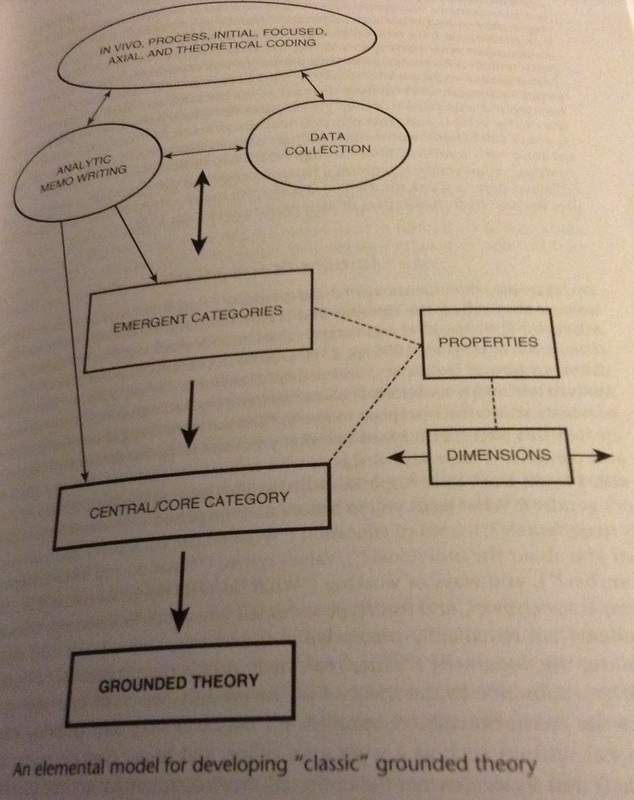 Glazer and Holton (2004) further clarify that “Memos present hypotheses about connections between categories and/or their properties and begin to integrate these connections with clusters of other categories to generate the theory”. Coding decisions are based on the methodological needs of the study. Depending on the qualitative coding method(s) you employ, the choice may have numerical conversion and transformation possibilities for basic descriptive statistics for mixed method studies. sub coding and simultaneous coding. structural coding is a question-based code that acts as a labelling and index device, allowing researchers to quickly access data likely to be relevant to a particular analysis from a larger data set. It’s used as a categorisation technique for further qualitative data analysis. descriptive coding summarises in a word or noun the basic topic of a passage of qualitative data. In Vivo Coding refers to coding with a word or short phrase from the actual language found in the qualitative data record. Process coding uses gerunds (“-ing” words) exclusively to connote action in the data. Initial Coding is breaking down qualitative data into discrete parts, closely examining them, and comparing them for similarities and differences. Values coding assess a participant’s integrated value, attitude, and belief systems. (side note: Questionnaires and surveys such as Likert scales and semantic differentials, are designed to collect and measure a participant’s values, attitudes, and beliefs about selected subjects). Versus Coding acknowledges that humans are frequently in conflict, and the codes identify which individuals, groups, or systems are struggling for power. Evaluation Coding focuses on how we can analyse data that judge the merit and worth of programs and policies. 4. Literary and Language Methods are a contemporary approach to the analysis of Oral communication. They include Dramaturgical Coding, Motif Coding, Narrative coding and Verbal Exchange Coding, and all explore underlying sociological, psychological and cultural constructs. 5. Exploratory Methods are preliminary assignment of codes to the data, after which the researcher might proceed to more specific First Cycle or Second Cycle coding methods. Holistic Coding applies a single code to each large unit of data in the corpus to capture a sense of the overall contents and the possible categories that may develop. Provisional Coding begins with a “start list” of researcher- generated codes based on what preparatory investigation suggest might appear in the data before they are analysed. Hypothesis Coding applies researcher-developed “hunches” of what might occur in the data before or after they have been initially analysed. Protocol Coding is coding data according to a pre-established, recommended, standardised or prescribed system. 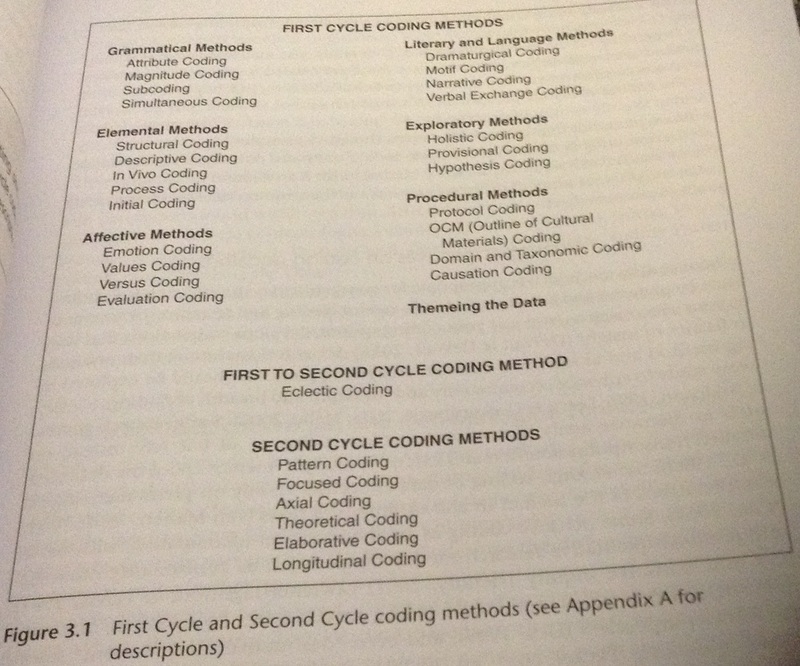 OCM (Outline of Cultural Materials) Coding is a systematic coding system for ethnographic studies. Domain and Taxonomic Coding is an ethnographic method for discovering the cultural knowledge people use to organise their behaviours and interpret their experiences. Causation coding is to locate, extract, and/or infer causal beliefs from qualitative data. Code Mapping is categorising and organising the codes, and code landscaping is presenting these codes in a visual manner, for example by using a Wordle graphic. Operational Model Diagramming can be used to map or diagram the emergent sequences or networks of your codes and categories related to your study in a sophisticated way. 1. Pattern coding is a way of grouping summaries into a smaller number of sets, themes, or constructs. 3. Axial coding describes a category’s properties and dimensions and explores how the categories and subcategories relate to each other. 5. Elaborative coding builds on a previous study’s codes, categories, and themes while a current and related study is underway. This method employs additional qualitative data to support or modify the researcher’s observations developed in an earlier project. 6. Longitudinal coding is the attribution of selected change processes to qualitative data collected and compared across time. Code weaving is the actual integration of key code words and phrases into narrative form to see how the puzzle pieces for together. Codeweave the primary codes, categories, themes, and/or concepts of your analysis into as few sentences as possible. Try writing several variations to investigate how the items might interrelate, suggest causation, indicate a process, or work holistically to create a broader theme. Search for evidence in the data that supports your summary statements, and/or disconfirming evidence that suggests revision of your statements. A social science theory has three main characteristics: it predicts and controls action through an if-then logic; explains how and/or why something happens by stating it’s cause(s); and provides insights and guidance for improving social life. The stage at which I seem to find a theory emerging in my mind is when I create categories of categories. Use categories and analytic memos as sources of theory. If I cannot develop a theory, then I will be satisfied with my construction of a key assertion, a summative and data supported statement about the particulars of a research study, rather than generalisable and transferable meanings of my findings to other settings and contexts. 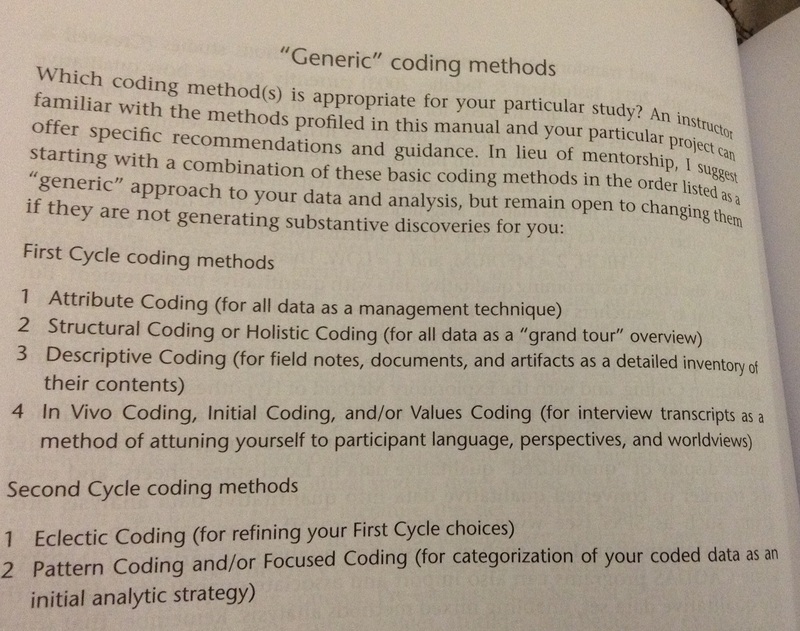 The coding journey should be noted in the analytical memos and discussed in your dissertation. Very helpful article. Can you please list the references you mentioned in the article? which book are you refering to explain the coding types? Thanks. Which specific reference would you like? I can look it up in the book. I also got a a question regarding the second cycle coding. Is it possible to use multiple coding forms? For example, can I code my interviews by using pattern coding, focused coding and axial coding? Or would I have to decide on one? Yes Lara, you can use multiple coding forms. Just keep a note of it for your write up.